Earlier today in my flashback to 1987, we saw the solo debuts of Foreigner's Lou Gramm and Boy George. Five years later, it was the turn of another singer from a chart-topping '80s act to release their first effort on their own. This time, however, it was a female singer who released her debut offering as a solo artist. She got off to a pretty good start, too - revisiting a section of the chart she'd been to many times before as one half of the previous decade's most consistently successful duo. Speaking of consistent, The Twelfth Man kept up his perfect chart-topping strike rate as "Marvellous" moved up to number 1 this week in 1992. Here's an Australian rock band that completely passed me by at the time, probably because they only (barely) reached the top 100 with this anthemic debut single. After two massive singles, the good times were over for BAD II - both in terms of chart success and their music, with this downtempo track bringing the mood right down. Australia's love affair with Amy Grant really was over. Not even a return to the bouyant pop of hits "Baby Baby" and "Every Heartbeat" (after ballad "That's What Love Is For") was enough to put her back among the 50 best-selling songs in the country. Two music videos exist for "Good For Me" - the original video, which was apparently scrapped for seemingly depicting a lesbian relationship and not childhood friends as intended, and the one you can see below, which features the same male model that appeared in "Baby Baby".. 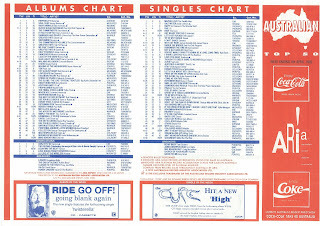 In a case of one single too many, the fifth release from Joyride became Roxette's first to not only miss the top 20, but peak outside the top 50. Not even the fact that the video for "Church Of Your Heart" was filmed in Australia could help its cause locally. I'm not sure it would've made any difference given the success the year-old album had already enjoyed, but I would've chosen either "(Do You Get) Excited?" (which seems to have had a video made for it) or "Things Will Never Be The Same" as a single ahead of "Church Of Your Heart", which I've never really liked that much. Just when Craig McLachlan finally released a song I kinda liked, he was back out of favour with Australian music buyers having only just returned to the top 50 with his first solo single, "On My Own", in late 1991. Co-written and produced by ARIA Producer Of The Year Simon Hussey (who also worked with Daryl Braithwaite and James Reyne), "One Reason Why" was a moody pop track that allowed Craig to prove he could belt it out with the best of them. Although his music career might have been struggling, Craig had more than one ball in the air in 1992. He swapped his electric guitar and rock star stubble for fishnets and makeup to play Frank N Furter in The Rocky Horror Picture Show - the first in a long line of musical theatre roles. Things hadn't been looking good for Wet Wet Wet and their fourth album, High On The Happy Side. The first two singles released from the album had received a less than rapt reception in the UK - and if they came out locally, they missed the top 100. But then sensitive ballad "Goodnight Girl" changed everything. It topped the UK chart for four weeks and returned the Scottish four-piece to the ARIA top 50 for the first time since "Sweet Surrender". The more mature, stripped back song was matched by the Wets' new grown-up, less pop image - and the whole package worked at shifting them out of Smash Hits territory. Things back on track, more hits followed in the UK, but in Australia, we wouldn't see Wet Wet Wet back in the top 50 until their next UK chart-topper came in 1994 - and then there was no escaping them! It'd been two-and-a-half years since Melissa Etheridge's last album, Brave And Crazy, but her Australian fanbase seemed to be as strong as ever with third release Never Enough giving her another top 10 on the albums chart. Things weren't quite as good on the singles side of things, with "Ain't It Heavy" the album's only top 50 hit. The song did win a Grammy, though. In 1991, Greatest Hits by Eurythmics had spent seven weeks at number 1 in Australia - a fitting end to a stellar chart career (up until that point) by Annie Lennox and Dave Stewart, which had also included chart-topping single "Would I Lie To You?" and 14 other top 20 hits. While Dave was quick off the mark with solo projects "Lily Was Here" and the Spiritual Cowboys album in 1990, Annie took time off from music to have a baby. She returned with her debut solo album, Diva, in 1992 and lead single "Why", which brought the album cover to life in the MTV Award-winning, Sophie Muller-directed music video. A rather sombre ballad, "Why" took Annie back to the vicinity of the ARIA chart she was accustomed to. 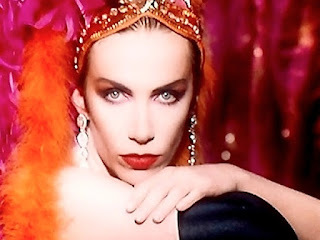 But, as we'll see in coming months, her solo career wouldn't prove to be anywhere near as consistent as the Eurythmics' had been - despite upcoming singles that I personally thought were much stronger than "Why". I could almost copy and paste my write-up for Melissa Etheridge here for Gary Moore, who was also back with his first album in a couple of years and had more success on the albums chart (another top 10 placement) than on the singles chart. Lead single "Cold Day In Hell" matched Melissa's "Ain't It Heavy" in peaking just outside the top 40. I could probably copy and paste whatever I wrote when "More Than Words" by Extreme reached the chart in 1991 here to describe this future number 1 single from previously unknown American rock band Mr Big. Like "More Than Words", "To Be With You" wasn't exactly typical of Mr Big's usual sound, as heard on previous single "Green Tinted Sixties Mind", but the acoustic sing-along would provide the band with a runaway hit, which topped charts around the world. The tale of unrequited love had been played by American radio stations from the Lean Into You album before it'd been picked as a single, but only a fool would've considered not releasing it - one listen and you knew it was going to be massive. As always in these kinds of situations, the question remained: what happened when people realised "To Be With You" wasn't what Mr Big normally had to offer? With their last album, Hysteria, Def Leppard had established themselves as the Michael Jacksons of the hard rock world. Released in August 1987, the album was still charting as late as early 1990 thanks to a seemingly endless stream of singles (including a re-release or two). By 1992, fans were more than ready for the follow-up - so much so that Adrenalize's lead single, "Let's Get Rocked", stormed into the top 100 at number 7 and instantly became the British band's biggest hit locally. Regular readers will know I'm not the world's biggest rock fan - understatement! - but I was actually a fan of Def Leppard's '80s output. I've even seen them live. But I found "Let's Get Rocked" a little too simplistic, especially the chorus. Nevertheless, its success proved that, despite the rise of grunge, there was still room - and an audience - for massively produced stadium rock. It'd hadn't been quite as long since the last studio album by The Cure, especially since remix album Mixed Up had come out in the gap since Disintegration. 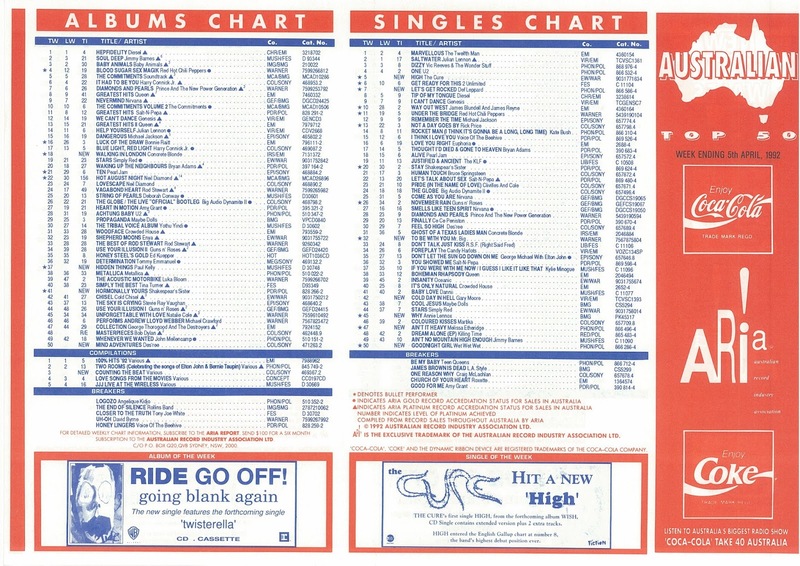 Even so, anticipation for Wish was, er, high enough for lead single "High" to also become the band's, er, highest-peaking single on the Australian chart - a record it holds to this day. Although it's a perfectly lovely song, "High" isn't what I'd consider to be The Cure's best ever single - and I attribute the fact that it out-performed crowd-pleasers "Let's Go To Bed", "Close To Me" and "The Love Cats" to the band's fanbase rushing out en masse to immediately buy it. Sure enough, it fell reasonably swiftly out of the chart after this leap into the top 5. Next week: another pop hit with an E Street link makes its debut, while Kylie Minogue bolsters her latest single with another club track. Hugh Wilson had won Starsearch in 1991, and so was probably the first of the nineties generation of talent show contestants. I didn't know about the original Amy Grant video for 'Good For Me'. I only remember the main version, which may have aired once on Video Hits. Thanks for the Hugh info - didn't find much info about him online at all! Hugh Wilson was later the vocalist in Vertigo. I never heard 'Innocent Child' at the time, either; which is surprising coming off the back of two top 10 hits. While not immediately catchy, it's a good song. I prefer the LP version and the original video of 'Good For Me'. You 'could' be so good for me doesn't really make sense with a friend you've known since childhood, though. 'Church of Your Heart' was a poor single choice. 'One Reason Why' was a decent song for Craig, and much better than 'Mona'… but not quite as good as ‘On My Own’ for me. 'Goodnight Girl' was something different, and I sort-of liked it. Unless they were omitted from the ARIA Report (some things are), the previous singles from the album weren't released locally - though earlier single 'Make It Tonight' was released as the follow-up in June, followed by 'Lip Service' in October. I've got the 'Ain't It Heavy' video, which doesn't seem to be on YouTube; unless it's blocked. I like 'Why', and eventually bought the 'Diva' album a year later, and the 'Little Bird' single, for which I have an interesting story to tell... but I'll save it until then! The opening bars of 'Cold Day in Hell' were often used as going-to-an-ad music on 'Hey Hey It's Saturday' that year. I liked 'To Be With You' at first, but then got a bit sick of it. Interestingly, the 'Lean Into It' album was released here nearly a year before this, in May 1991. By this point, Def Leppard sounded virtually interchangeable with Bryan Adams, even down to the backing vocals. I generally prefer moody/strange The Cure to their more-upbeat/poppy stuff like 'High'. It was a pleasant surprise to see them in the top 5 though. I found it amusing at the time that the 'Single of the Week' bit at the bottom of the chart says "HIGH entered the English Gallup chart at number 8, the band's highest debut position ever" and the chart above shows The Cure debuting at number 5! Ha! Okay, I was easily amused. I didn't know "Innocent Child" was a single – I got the BAD II album and thought it was really good, still do. I wanted my money back after hearing the "Church of Your Heart" cassingle – and I got it for free. Hugh Wilson won Male Vocalist section, Anna Maria Lispina won Female Vocalist (later backing singer for Savage Garden), Devils In Heaven won Band Section, Umbilical Bros came 2nd in Comedy Section and Sergio Montoya won Dance section (now in jail for child molestation). There was also a child section, but can’t remember the results for that.